The ocean is the largest solar energy collector on Earth. Not only does water cover more than 70 percent of our planet’s surface, it can also absorb large amounts of heat without a large increase in temperature. This tremendous ability to store and release heat over long periods of time gives the ocean a central role in stabilizing Earth’s climate system. Explore this interactive graph: Click and drag to display different parts of the graph. To squeeze or stretch the graph in either direction, hold your Shift key down, then click and drag. This graph (source data) shows differences from the long-term average global ocean heat content (1955-2006) in the top 700 meters of the ocean. The main source of ocean heat is sunlight. Additionally, clouds, water vapor, and greenhouse gases emit heat that they have absorbed, and some of that heat energy enters the ocean. Waves, tides, and currents constantly mix the ocean, moving heat from warmer to cooler latitudes and to deeper levels. Heat absorbed by the ocean is moved from one place to another, but it doesn’t disappear. The heat energy eventually re-enters the rest of the Earth system by melting ice shelves, evaporating water, or directly reheating the atmosphere. Thus, heat energy in the ocean can warm the planet for decades after it was absorbed. If the ocean absorbs more heat than it releases, its heat content increases. Knowing how much heat energy the ocean absorbs and releases is essential for understanding and modeling global climate. Historically, taking the ocean’s temperature required ships to dangle sensors or sample collectors into the water. This time-consuming method could only provide temperatures for a small part of the planet’s vast ocean. To get global coverage, scientists turned to satellites that measure the height of the ocean’s surface. As water warms, it expands, so estimates for ocean temperature can be deduced from sea surface heights. To get a more complete picture of ocean heat content at different depths, scientists and engineers also use a range of in situ temperature-sensing instruments. Among these are a fleet of more than 3,000 robotic “floats” that measure ocean temperature around the world. Known as Argo floats, the sensors drift through the ocean at different depths. Every 10 days or so, according to their programmed instructions, they rise through the water, recording temperature (and salinity) as they ascend. When a float reaches the surface, it sends its location and other information to scientists via satellite, and then descends again. Scientists constantly compare data from satellites, floats, and probes to verify that the values they produce make sense. They process the range of measurements to calculate an estimate for global average ocean heat content every three months. Converting the temperatures to joules (a standard unit of energy) allows them to compare heat in the ocean to heat in other parts of Earth’s climate system. 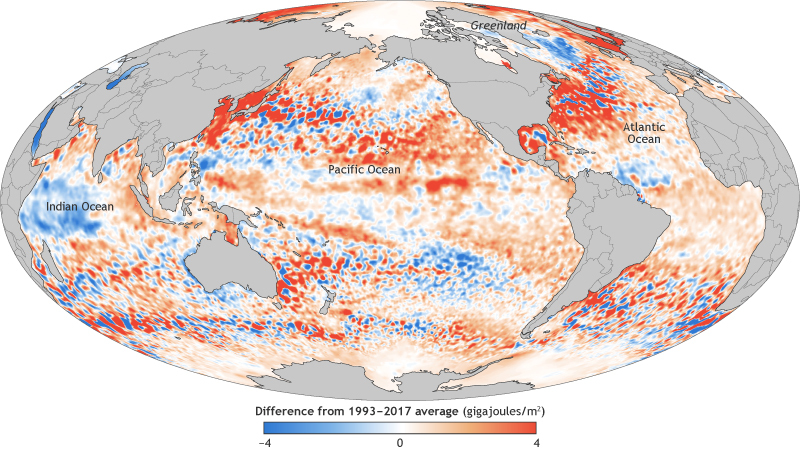 Worldwide, most ocean basins had higher-than-average heat content in 2017, according to the State of the Climate in 2017, consistent with the long-term trend of ocean heat uptake due to global warming. Exceptions include the central South Pacific and the western tropical Indian Ocean, a feature that the State of the Climate authors attributed to an unusual eastward flow of warm surface water back toward the other side of the basin. (Because of the Earth’s rotation, prevailing surface winds and currents near the equator are generally westward). Global map showing where 2017 heat content in the top 700 meters (2,300 feet) of the ocean was higher (orange) or lower (blue) than the 1993–2017 average. NOAA Climate.gov map, adapted from State of the Climate in 2017. Another interesting pattern is the stark contrast between much higher-than-average heat content in much of the North Atlantic and much lower-than-average heat content in the waters south of Greenland. According to the report, this heat build up in the North Atlantic has persisted since 2009, and the lower-than-average heat content south of Greenland has been in place since at least 2014. The reason for this pattern has not been entirely established, but it may be associated with a reduction in the Atlantic meridional overturning circulation. More than 90 percent of the warming that has happened on Earth over the past 50 years has occurred in the ocean. Recent studies estimate that warming of the upper oceans accounts for about 63 percent of the total increase in the amount of stored heat in the climate system from 1971 to 2010, and warming from 700 meters down to the ocean floor adds about another 30 percent. Averaged over Earth's surface, the 1993–2017 heat-gain rates are 0.36 (±0.06) to 0.40 (±0.18) watts per square meter for 0–700 meters, and 0.19 (±0.07) to 0.35 (±0.03) for depths of 700–2,000 meters. Less than a watt per square meter might seem like a small change, but multiplied by the surface area of the ocean (more than 360 million square kilometers), that translates into an enormous global energy imbalance. It means that while the atmosphere has been spared from the full extent of global warming for now, heat already stored in the ocean will eventually be released, committing Earth to additional warming in the future. Ocean heat content over time from the sea surface to a depth of 700 meters (2,300 feet) in shades of orange, and from 700-2,000 meters (6,600 feet) in shades of purple. (Different colors represent different data sets. Details can be found in Figure 3.6 of State of the Climate in 2017.) The upper ocean and deeper ocean trends are both strongly positive, with 2017 exhibiting record-high values for both. Graph by NOAA Climate.gov, adapted from State of the Climate in 2017. In the present, warming of ocean water is raising global sea level because water expands when it warms. Combined with water from melting glaciers on land, the rising sea threatens natural ecosystems and human structures near coastlines around the world. Warming ocean waters are also implicated in the thinning of ice shelves and sea ice, both of which have further consequences for Earth’s climate system. Finally, warming ocean waters threaten marine ecosystems and human livelihoods. For example, warm waters jeopardize the health of corals, and in turn, the communities of marine life that depend upon them for shelter and food. Ultimately, people who depend upon marine fisheries for food and jobs may face negative impacts from the warming ocean. Information on how ocean heat content is calculated from ocean temperatures is available from NOAA’s National Oceanographic Data Center. Scott, Michon. 2006. Earth’s Big Heat Bucket. NASA Earth Observatory. Accessed February 2, 2011. Lindsey, Rebecca. 2008. Correcting Ocean Cooling. NASA Earth Observatory. Accessed February 2, 2011. Johnson, G.C., Lyman, J.M. , Boyer, T., Cheng, L., Domingues, C.M., Gilson, J., Ishii, M., Killick, R., Monselesan, D., Purkey, S.G., Wijffels, S.E. (2018). Ocean heat content [in State of the Climate in 2017]. Bulletin of the American Meteorological Society, 99(8), S72–S77. Rhein, M., S. R. Rintoul, S. Aoki, E. Campos, D. Chambers, R. A. Feely, S. Gulev, G. C. Johnson, S. A. Josey, A. Kostianoy, C. Mauritzen, D. Roemmich, L. D. Talley, and F. Wang,2013: Observations: Ocean. In: Climate Change 2013: The Physical Science Basis. Contribution of Working Group I to the Fifth Assessment Report of the Intergovernmental Panel on Climate Change [Stocker, T. F., D. Qin, G.-K. Plattner, M. Tignor, S. K. Allen, J. Boschung, A. Nauels, Y. Xia, V. Bex and P. M. Midgley (eds.)]. Cambridge University Press, Cambridge, United Kingdom and New York, NY, USA, doi:10.1017/CBO9781107415324.010. S. Levitus, J. I. Antonov, T. P. Boyer, R. A. Locarnini, H. E. Garcia, and A. V. Mishonov. 2009. “Global ocean heat content 1955–2008 in light of recently revealed instrumentation problems” Geophysical Research Letters, 36, L07608, doi:10.1029/2008GL037155. T. P. Boyer, J. I. Antonov , O. K. Baranova, H. E. Garcia, D. R. Johnson, R. A. Locarnini, A. V. Mishonov, T. D. O’Brien, D. Seidov, I. V. Smolyar, M. M. Zweng, 2009. World Ocean Database 2009. S. Levitus, Ed., NOAA Atlas NESDIS 66, U.S. Gov. Printing Office, Wash., D.C., 216 pp., DVDs. Global Ocean Heat Content from the National Oceanographic Data Center. More than 90 percent of the warming that has happened on Earth over the past 50 years has occurred in the ocean. Averaged over Earth's surface, the 1993–2017 heat-gain rates are 0.36–0.40 watts per square meter for 0–700 meters, and 0.19–0.35 for depths of 700–2,000 meters. Heat already stored in the ocean will eventually be released, committing Earth to additional warming in the future. 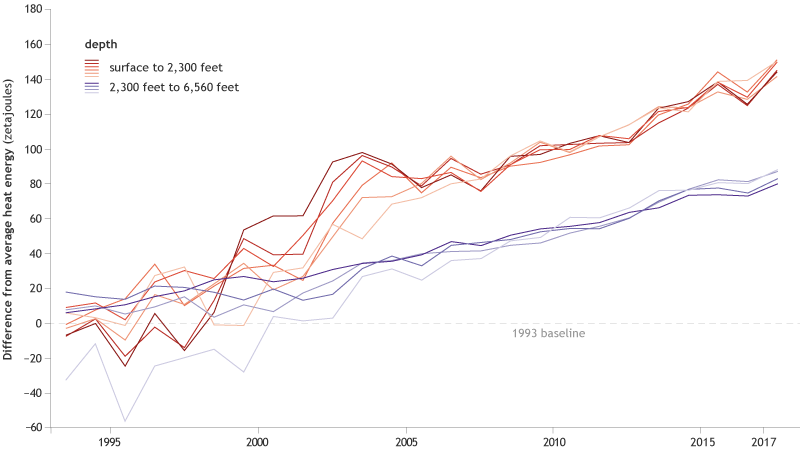 Increasing ocean heat content is contributing to sea level rise.